Saturday night I left the shop at 10pm with 3 bottles of Flensburger Gold and a bag of popcorn kernels. For the last couple of weeks I've been stopping in to Xtra-Vision wearing my disguise and renting that teenage love story 'Twilight', Saturday we bit the bullet and Louise bought it. Saturday night cold glass of beer in hand, tracksuit, kleenex and popcorn. Best Saturday night in ages. This pours a golden fresh colour with great carbonation. The nose is Fresh, fruity with some caramel notes. The palate is an appley style of beer with a slightly bitter biscuity finish. Really refreshing and easy drinking after a hard day at the office and a very emotional flick. When finished with the beer this bottle twilight's!!!!!! as a good salad dressing bottle- it has one of those old fashioned flip-top caps...... A tip from Mary Fitzgerald/Ruth Deveney. 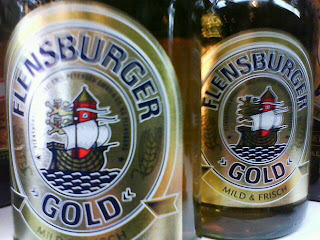 Flensburger Gold 330ml €2.29 each, available in Deveney's Dundrum.